Review: Yep. "A Very Harold & Kumar 3D Christmas" is Funny. In 2004, a small stoner film called "called "Harold and Kumar Go to White Castle" caught America off guard, as it was actually funny. Starring Kal Penn and John Cho, it was an over-the-top comedic romp with absolutely zero respect for anything—except getting high and eating burgers. The duo slogged through a well intentioned, but ultimately disappointing, sophomore slump in 2008, with "Harold & Kumar Escape From Guantanamo Bay." Now the boys are back for a third installment that manages to recapture some of the original magic. 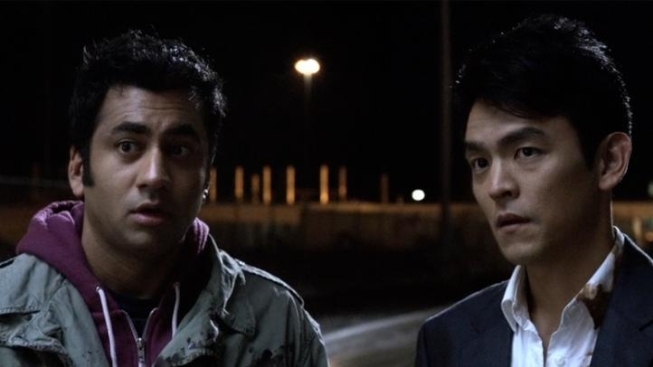 The miracle of "Harold & Kumar" is that they were a post-racial duo long before Obama put the words on everyone's lips. A Korean guy and an Indian guy who switch seamlessly from ignoring their race to mocking it to mocking the race of others, they approach ethnicity like most sensible people—with humor, often of the very biting variety. One of the countless tragedies of racism is that racial humor is typically left to racists, who tend to be rather stupid, which in turn makes them not terribly funny. But because neither of our heroes is white, they are free to fire away, and do so with a glee and absence of malice that really make it sing. It's too bad society at large hasn't caught up with Harold and Kumar, because stars Penn and Cho both deserve roles beyond this fun little niche. "A Very Harold & Kumar 3D Christmas" is crass, absurd, profane and gross (there's an homage to "A Christmas Story" that will make your skin crawl), but it's done with more than enough wit and heart to make it genuinely funny. When NPH tells the guys he'll see them in the fourth film, it actually comes as welcome news.